1910 Long Reef looking towards Dee Why. The land passed on to James Jenkins and it remained in the family for the balance of the nineteenth century. It was used to grow some crops, notably oats, and for dairying and general grazing. Some butter was produced. By the end of the 1890’s the owner, Jenkins’ daughter Elizabeth bequeathed her estate to the Salvation Army who continued farming until 1912. At that time public resentment at their being denied access to beachfront areas by the “Army’s” farm fences and rate demands, led to the Crown resuming the area. It was named Griffith Park after the Minister for Lands, the Hon Arthur Griffith, the principal party in acquiring it from the Salvation Army. Griffith Park was then developed as a public recreation area with camping permitted and approval to set out a golf course was given by Council to a Mr. Martin and his golfing enthusiast’s in 1920. 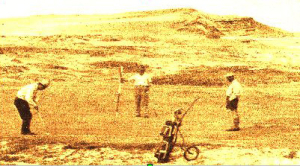 May 1924 the Long Reef Golf Club was formed and was a nine hole course up until 1927 when eighteen holes were approved. where the seventeenth now is. Research information from the book on Long Reef Golf Club “First Sixty Five Years” by Ross Lanes.